A Voyage takes you to Oasis, naturally. No, these are not my travel plans, Amazon just announced the new Kindle Oasis, an even more premium premium e-book reader. The new design tapers the thickness to just 3.4mm on one end, keeping the other end thicker (kind of looks like a folded magazine). AND YOU GET PAGE TURN BUTTONS BACK... sorry, just not a fan of the touchscreen page flip. Anyway, this curved design allows for premium covers to be magnetically attached (firmly, there are 12 magnets!). The covers are bound in high-quality leather (Black, Walnut, Merlot) and have a built-in battery. 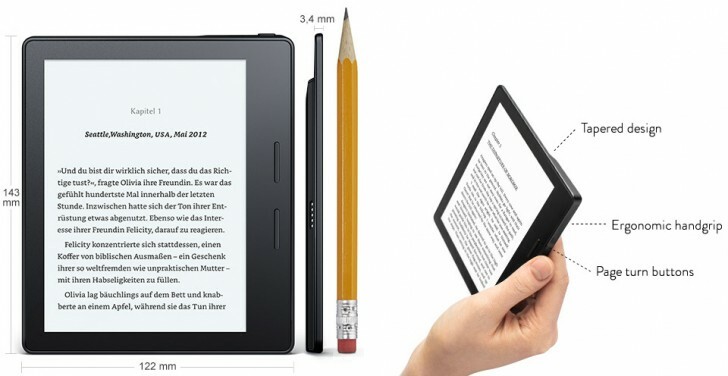 This extends battery life and simplifies charging - you can read on the Kindle and charge the cover, then head out with both knowing you'll never run out of juice. Not that this is much of an issue with months of battery life, but still. The other major upgrade is the backlighting. There are now 10 LEDs that illuminate the page more evenly, compare that to the 6 LEDs in the Voyage and just 4 in the regular Paperwhite. The screen is still 6" big with 300ppi pixel density, same specs as the Paperwhite and Voyage. The Oasis is lighter though (131g without cover vs. 180g), though despite its name it is not waterproof in any way. 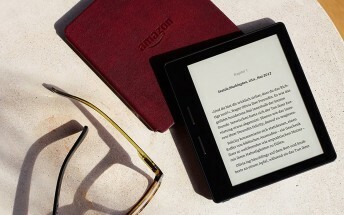 The Amazon Kindle Oasis is pricey at $290/€290 (€350 with 3G).